This is generally listed as a spring growth-habit wheat. I planted my crop in the previous fall and it survived the winter fine. 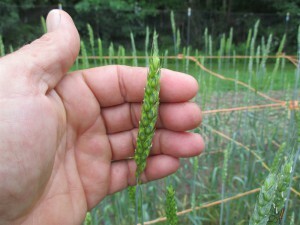 This is a versatile wheat that can work for fall plantings or spring. It is a hard red wheat with exceptional flavor and baking qualities. There is a lot of questions around the historical source for this variety. Some claim it originated in Russia, others say Scotland and still others say Poland. The most likely possibility is that it came from Europe to Canada, and was eventually introduced into Wisconsin in 1860. In any case, it became the founder crop for the flour industry of Minneapolis. My seed source came from a friend, here locally, who got his original seed stock from his uncle, who had been organically farming Red Fife in Blufton Ohio for a number of years. This wheat is fairly lodge resistant and disease resistant as well. Recently, I received more seed from another grower in Kentucky. I plan to grow out both, together, next season and increase the gene pool for this important wheat cultivar!